Claudio Silva says he can't wait to return to the UFC Octagon at UFC Liverpool after three years on the sidelines. 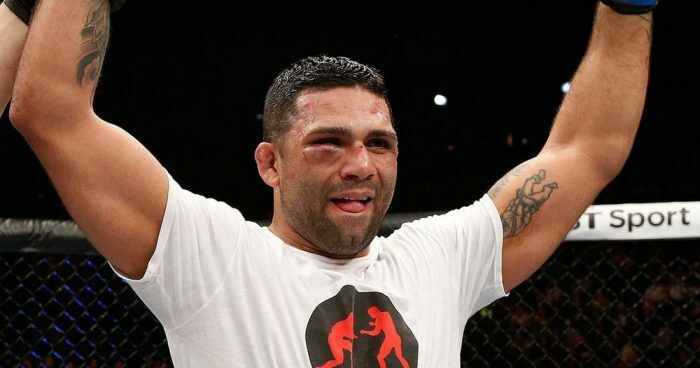 Claudio “Hannibal” Silva will return to the UFC Octagon on May 27 when he faces Nordine Taleb at UFC Liverpool in the Echo Arena. Silva hasn’t fought since defeating Leon “Rocky” Edwards in November 2014 and the announcement yesterday that he would return to action came as a shock to the majority of the MMA community. Speaking exclusively to MMANytt.com earlier today, Silva revealed why he’d been out of action for such a long period of time. “I wasn’t fighting because I had to have some very serious surgery,” Silva said. Whilst others may have given up hope of fighting after such a long period out of action, Silva was never willing to stop dreaming that he’d one day make a return. His fight with Taleb on May 27 will see him try to continue an 11-fight win streak that dates all the way back to 2007 when he defeated Paul Jenkins at AM 14 – Ready for War in Somerset, England. “I’m so happy to be back fighting,” Silva said. “I have always been following the fights and I’ve always been anxiously waiting to see if I could ever fight again. “UFC Liverpool is going to be an amazing event and I can’t wait to be apart of it.